Dr. Terry knew by the time he was in high school that he would work in a health care profession. He always admired his family dentist and decided to follow that path by the time he entered university. He completed his education at the Medical College of Georgia, graduating in 1983. “I enjoy getting people out of pain and transforming their lives by changing their appearance. After 30-plus years in practice, I still love working with my patients every day.” Dr. Terry specializes in using gentle techniques and the best, most aesthetically pleasing dental materials. Your comfort, safety and overall health are kept in mind every step of the way. He has a passion for helping you achieve a beautiful smile that will last a lifetime! After completing his education, Dr. Terry completed a postgraduate residency in general practice in 1984. He continued his training at the Las Vegas Institute of Cosmetic Dentistry, where he studied advanced treatment for temporomandibular joint (TMJ) dysfunctions. There, he also honed his technical skills in occlusal function, smile analysis and cosmetic dentistry. 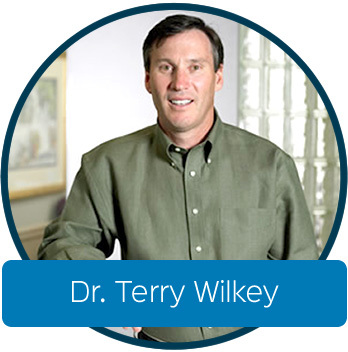 Dr. Terry regularly attends continuing education courses in areas such as implant dentistry, periodontal therapy, bite relationship problems and root canal therapy. When Dr. Terry isn’t busy serving patients with excellent dental care, he enjoys boating on Lake Harding with his children. Get the high-quality and affordable dental care your family needs. Contact us today to schedule an appointment.